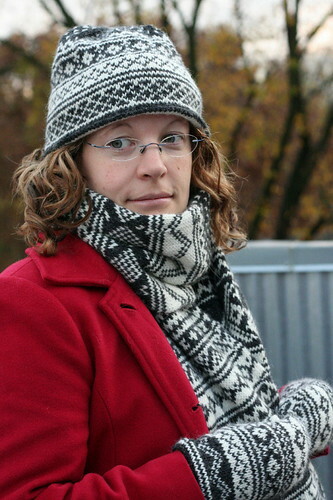 Because of the new patterns I’ve put up this month, I feel as if I haven’t been blogging enough about my current knitting. 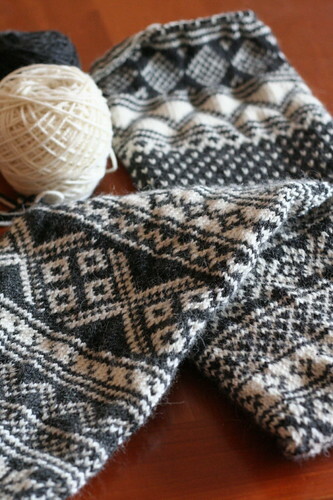 The knitting interest I lost this summer is back, and my projects feel even more addicting than ever. I credit both the chill of autumn and not having any wool sweaters that fit over my gigantic belly with its return. Like the hat I posted last week, this began as a Scandinavian-style sampler to test out some stitch patterns for a hat and scarf set I was planning. 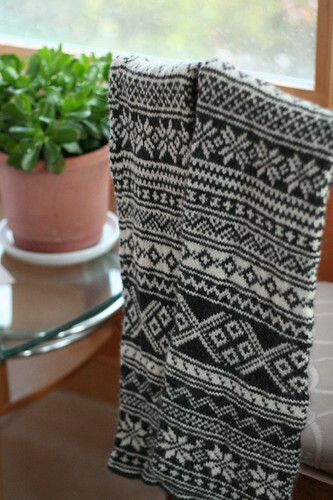 After a few inches, I thought it would make a nice edging for a simple, stockinette scarf. 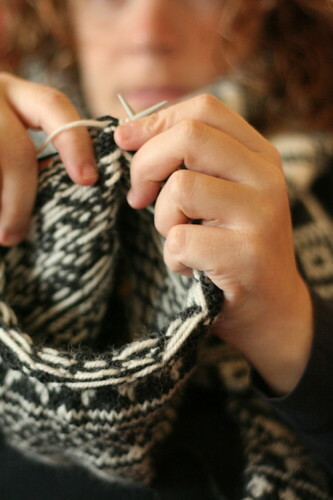 A foot into it, I decided to make the edging longer because it was so much fun to knit. 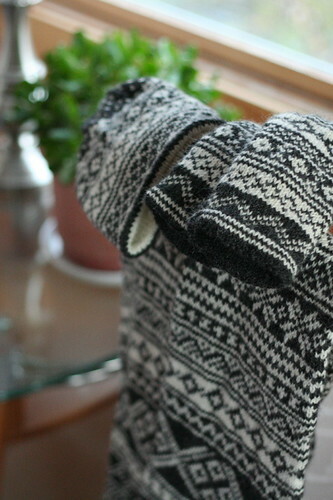 Finally, I capitulated and eliminated all of the stockinette. 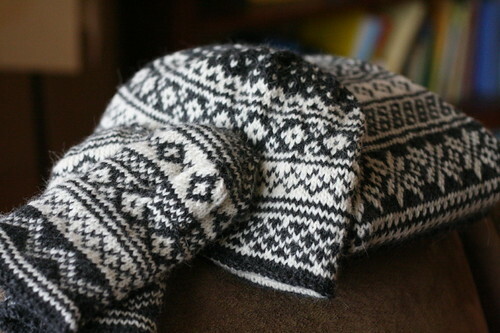 You cannot imagine how addicting this knitting is! What is fascinating to me is that with the exception of four peeries, all of the patterns are so very simple: 2-, 4-, 8-, and 16-stitch repeats. So easy are they, in fact, that I have barely consulted my chart. 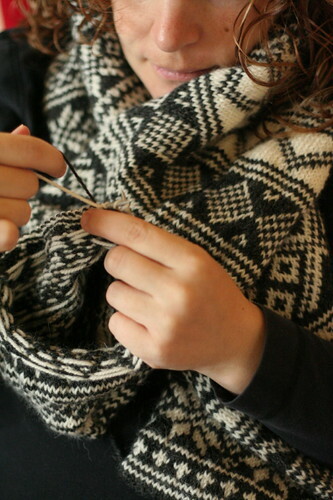 And yet, the scarf looks impossibly complicated. Isn’t that wonderful? So little effort for so much effect! Although I have not been able to work on it consistently this month, I try to log a few peeries every day. I have about 18 inches to go. And then the hat. 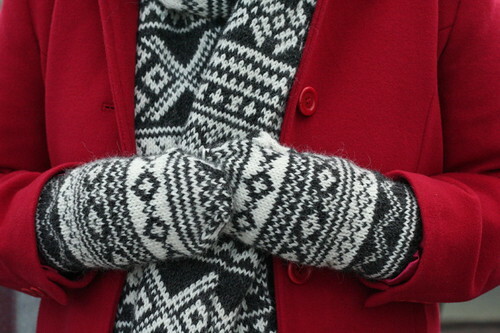 And maybe some mittens. Please, someone stop me! Hypothetically speaking, if one were to lose a stitch marker down that hole, there’s little hope of getting it back. Not that I would be so careless. Nope, not me. Stay tuned for Min Ulla progress! 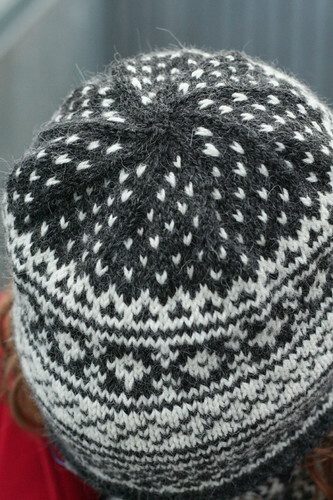 * Actually, I knit it in the round because I was far too lazy to purl back. 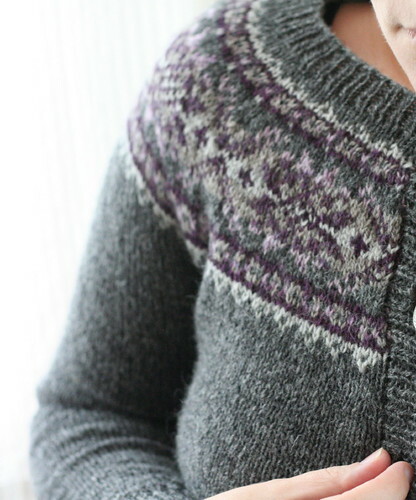 I am happy to present Plum Frost Pullover & Cardigan! 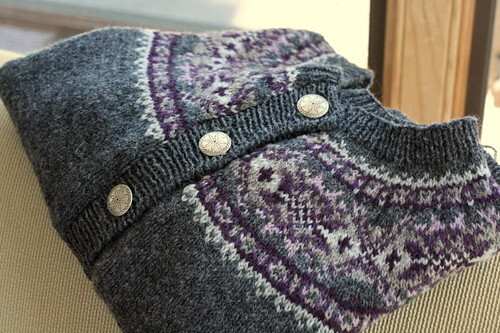 Knit seamlessly in the round from the bottom up, this simple, versatile, women’s pullover/cardigan pattern features a classic XOXO stranded pattern in the 6-color yoke, with stars occupying the lozenge positions. The main color (charcoal) fades out to nearly white within the stranded pattern while, at the same time, a light purple darkens toward the center of the band. Hourglass waist shaping and fitted sleeves outline a flattering style to most sizes and shapes. The bottom band, button bands, neckband, and sleeve cuffs are worked in K1, P1 rib and employ tubular cast-ons and bind-offs. 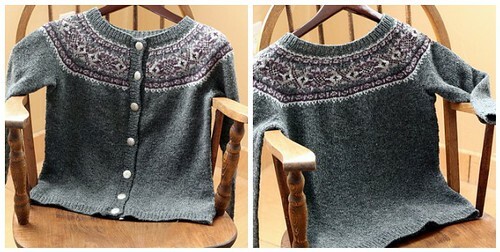 The cardigan version is steeked open; however, it is essentially the same pattern as the pullover, measuring 1″ wider in the body only because of the button band. 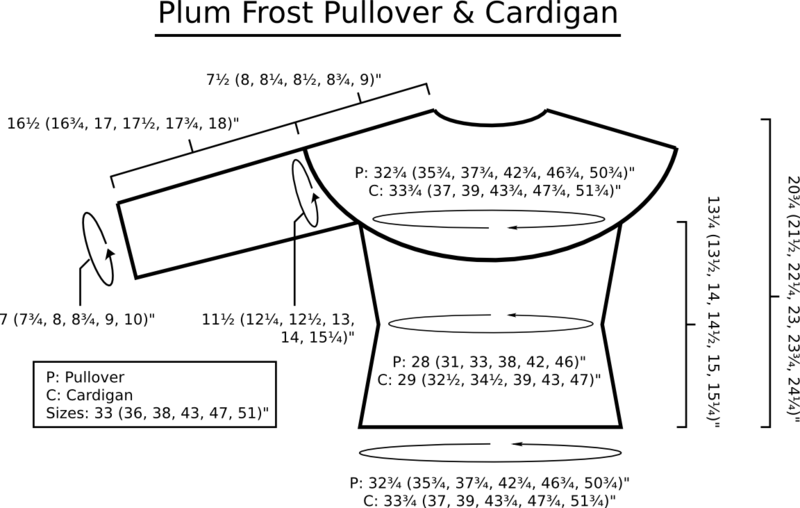 The pattern is designed to fit bust measurements from 33″ to 51″ . It will be available for purchase from my Ravelry shop for $6.50 beginning Wednesday, October 7. 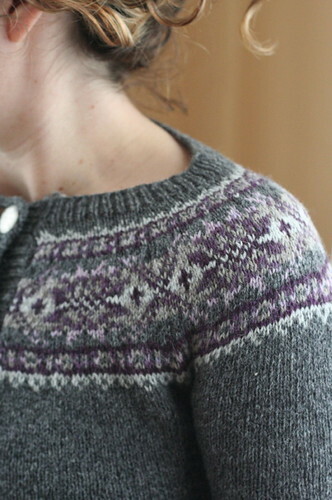 I could not be happier with how well this particular garment turned out. 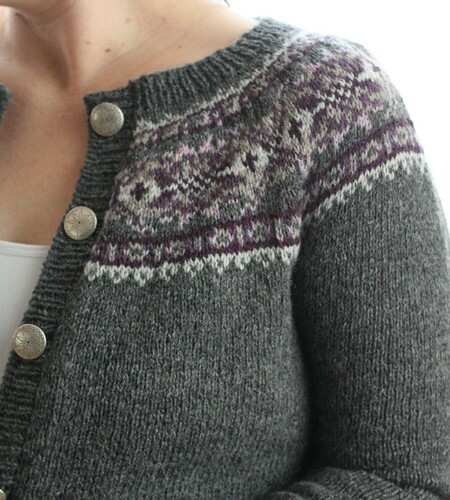 Harrisville’s Shetland yarn is such a delight to use. Just as I began to find my stranding rough and lumpy, I soaked the pre-steeked version and it was instantly transformed. The yarn blooms so well, filling in errant gaps between stitches, smoothing out the yoke, and blending the colors together. I really cannot speak highly enough of how magnificently Shetland blooms: I’ve never experienced anything quite like it with any other yarn. While it is unmistakably a very woolly yarn, it is somehow soft enough that I can wear it next to my skin without itching all over. I have used it often in the past (e.g. 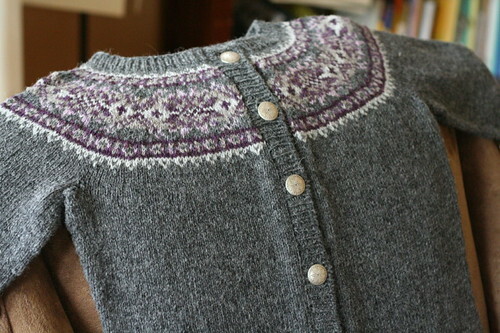 Vine Lace Pullover, Scoopneck, Vespergyle Mittens, Ivy League Vest), and I will certainly return to it again. Besides, now I have leftover bits in lots of colors! One of the things I needed in a yarn for this piece was a color choice that included three close shades of each color (i.e. gray and purple). There are only a few yarn companies that offer such thorough color palettes: Harrisville, Jamieson’s and Knit Picks are ones that come to mind. 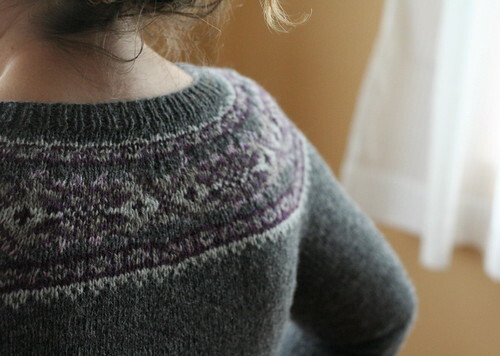 I do not care for Knit Picks’ Palette yarn, and Jamieson’s is both out of my budget and unavailable locally. Not only that, my local yarn shop carries the full line of Harrisville Shetland – all 56 colors – on cones, which makes it quite an economical option for me. 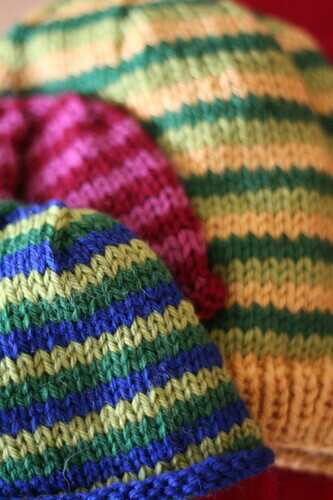 Another thing I love about all of Harrisville’s yarns is that the lines and color offerings are so stable. As long as I have a color card on hand, I know exactly what I will be getting when I pick out colors. How often do other companies discontinue colors or particular yarns altogether? 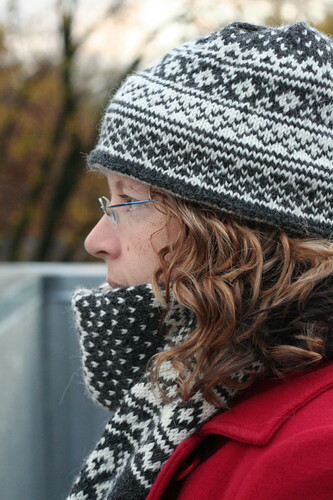 I still miss Magpie Aran and Skye Tweed – surely we all have our own personal, discontinued favorites. Anyway, I appreciate the wide selection and stable offering. 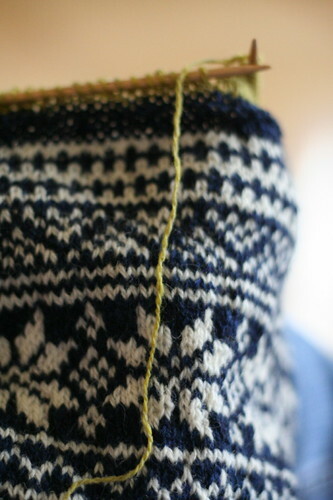 Without it, fair isle projects would surely be much more difficult to plan! Because I like the yarn so much and want to support their business, I contacted Harrisville Designs about this particular pattern. 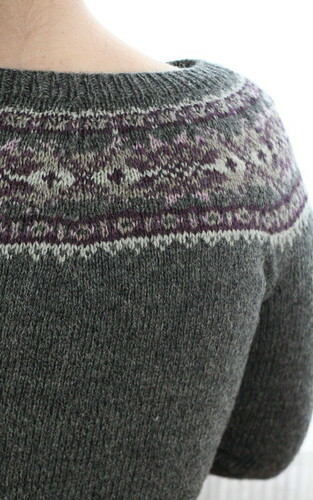 The company has generously offered to donate the yarn for one lucky commenter to make a Plum Frost pullover or cardigan! Please leave a comment by Wednesday, October 7 at 8 a.m. CST to be entered in the contest. 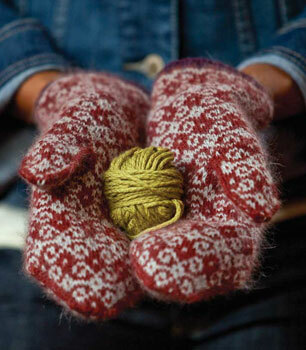 I will use a random number generator to choose a winner to receive the yarn and a free copy of the pattern. 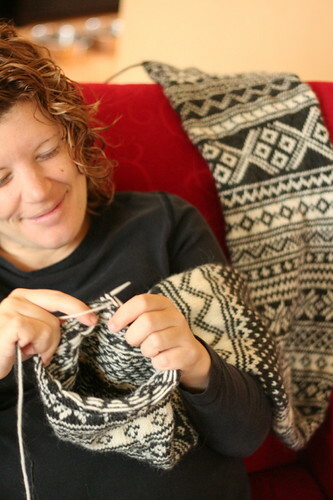 I hope you will love both the yarn and the pattern as much as I do! * Can you believe I actually published that link?? I felt it was only honest. You’re welcome.